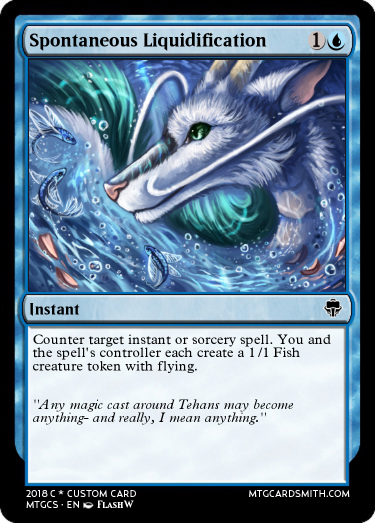 This is a token for Mist of Shades. Alright, I'M BACK, BABY! I have returned from my weekend trip, and am ready to continue creating Story Blurbs! That night, Aggrol slept soundly. He had made a small shelter just outside the town, as he was too big for any human beds. While he slept, he dreamed of a large tower. The tower seemed to be pulling him towards him, and when he reached it, he suddenly realized that this was the thing that was keeping him from leaving here. He then knew that, eventually, he was going to have to get there. He soon awoke from his slumber, and walked back to the town. It looked like Cliff and Mayor Beralize were having an argument. "You promised me that I would get 5 percent of the treasure!" Cliff was saying. "We had a deal!" "Well, do you know how much treasure that is? That's a lot! What would a kid like you even do with that money?" Beralize shouted. "Hey! A deal's a deal! What does it matter what I will do with it? The community still gets their 85%, and you and that Aggrol dude both get 5%. It's a win-win! It's completely fair!" They had negotiated the deal the last night. Each of the three adventurers got 5%, and the rest of it went into the community funds of the town. "Hold on now," Aggrol intervened. "What's the problem?" "She wants to cut me and you out of the deal!" Cliff yelled. "So she can have more for herself! She doesn't even need it! She controls the community funds!" "Is this true?" Aggrol said, "Are you really going to cut out the only two people who did any work on that expedition? This is unacceptable!" The townsfolk were beginning to take notice now. "Huh?" "What do you mean she just wants more for herself?" "But she said that she did all the work!" "Now, now. Let's not jump to conclusions..." She said. But even as she said it, the townsfolk began to get angry. "We elected you because you said that you were selfless. You said that you only wanted what was good for the town. But now we see that those were all lies. You only look out for yourself." Cliff said. "And I think that the others will agree with me. All in favor of a new election?" Nearly every single hand in the crowd went up. When Aggrol's hand went up, the remaining few suddenly agreed. Long story short, someone else was elected mayor, and it was found that Beralize had been stealing from the community fund for years. Cliff offered to go with Aggrol on his journey, but he refused. "This is my journey. I can't have you tagging along. It will be a dangerous road, I can feel it, and I wouldn't want you getting hurt. And anyways, this town needs a protector. I have a feeling that you will grow up to be a fine warrior. I must go now. Best of luck to you and the rest of Gewar." And with that, Aggrol began his journey through the plains. This one was kind of just wrapping up the Gewar storyline, and as such, not much really happened. I will try and post that map that I was talking about sometime soon, (probably tomorrow) but I don't know how to post pictures from my computer to a comment like you do card images. Could someone show me how? Wow, this discussion has not had very much going on recently. And I have been very busy, so I have not been able to do one of these in a few days. But here is the beginning of a new chapter in Aggrol's storyline. We have left the town of Gewar and it's characters, and now we go into the plains! As Aggrol set out into the plains, he found himself thinking about the tower he had seen in his dream. He had no idea how to get there, but he knew he had to. And when he did, what then? Would he just be sent back home? Would there be challenges at the tower? How would he get back home? Were there others trapped here that also needed the tower? All these questions and more were jumbling around in Aggrol's mind when he fell into the sinkhole. He awoke in a large cave. At first, he thought that it was empty, but as his eyes adjusted to the darkness, he saw that there were plenty of small creatures in the darkness. "Goblins. 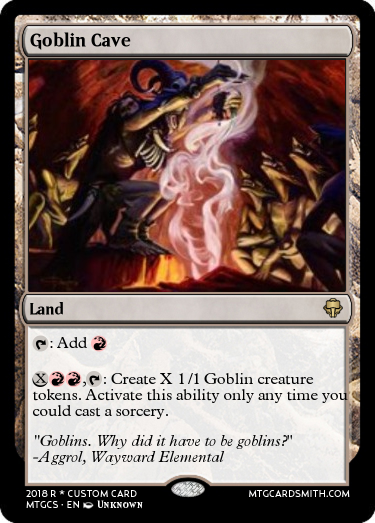 Why did it have to be goblins?" he said. Most things didn't frighten him, but for some reason goblins just freaked him out. He looked for the exit. He found it, a dark tunnel probably leading to another cave, but he was surrounded. And they were coming closer. Well that's the end of that. Not all of them need to be ridiculously long. See you tomorrow! The first challenge begins next Friday the 31st. This will also be the deadline for new players to join. 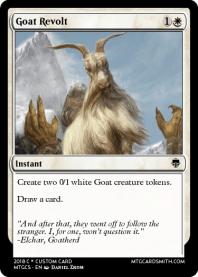 Niche: GOATS! 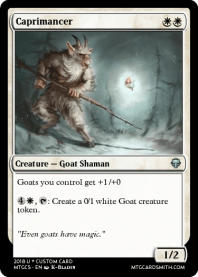 As well as gaining life and drawing cards, but mostly goats. When he awoke, he was surrounded by goblins (again). Then, he saw an enormous shadow in the one spot in the room with no goblins. The shadow moved... and something came out. He didn't recognize it. There was certainly nothing like it on Degar. "Who are you?" the creature asked. It was obvious that it wouldn't take nobody for an answer. "I am Aggrol, of Degare. I simply fell down a sinkhole, and found my way here. I will go peacefully if you just let me leave." The thing scowled at him. "No. I will feast on your magical essence. I have been starving for years down here. These things don't have much magic on their bones." "Then why don't you just leave?" "Because of these things. Every time I try, they grab on and won't let me. There's enough of them that it works. Anyways, you look very tasty indeed." The monster lunged at him. Aggrol immediately found himself weakened. He found himself thinking that it would have been very good if his hydra hadn't been behind him just enough that it didn't fall in with him. Last he had seen it, it had been looking down, giving him a look like, I'm not going to jump down there! What are you, crazy? "Mmm... Your magic is quite filling indeed. I will not go hungry for years!" the thing said. Aggrol summoned an elemental, but the best he could muster in his weakened state was something about as big as a goblin. Well, he thought, if I can't win this with magic, I'll have to win it with strength. So he charged up to the thing, and tackled it. "Ugh! What was that?" the thing howled. "You can't use physical power! That's unfair!" Aggrol began punching the thing in the face. "You-ow-asked-ow-for-ow-it!" the thing shouted. A massive ray of fire shot from it's open mouth, blasting Aggrol across the room. He squished a few goblins along the way, and from then on, they steered clear. By now, Aggrol was completely out of power. It was almost like the thing had an aura of magic depletion. "By the time I'm done with you, you'll just be a lifeless hunk of rock!" the thing screamed as it hit Aggrol with another firebreathing attack. Aggrol had to find a way to beat this thing, and fast. P.S. 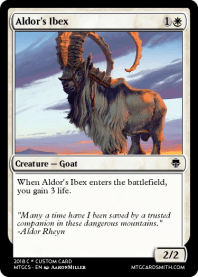 @Decaldor on Aldor's Ibex, it says Armorclad Ibex in the text box. Just thought I'd point that out. 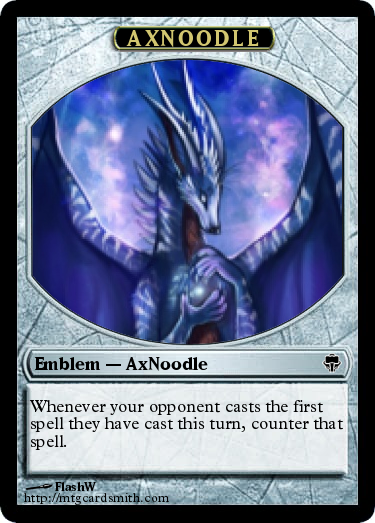 And @AxNoodle where are your supporting cards? @Aggroman15 They are coming, and I am planning on making them now! @Jonteman93 Here is my first spell. Aldor looked up. He flinched as cold, dirty snow blew into his eyes. He reached out with his hand. The ice was biting, and not even his fur coat could protect him from these temperatures. He risked another glance, but couldn't see anything but white snow against a bleak, cloudy background. He reached out again, and this time his hand felt something. His staff. It was given to him back in the Fields. Where was he now? Aldor pulled himself up to his knees. He raised his free hand slowly. A pulsating center of light appeared, hovering above it. The chill disappeared, and Aldor stood, his power restored. He looked around. Behind him was snow-covered rock, jutting into the clouds. Before him, though, was a vast expanse of hills and plains and villages, and, in the far distance, a glistening city. This was not Galascia, but Aldor didn't care. He raised his staff and a brilliant ray of light exploded from it, into the air. Bleats came in response from all around the mountain. Aldor smiled and began his descent. The great storm rumbled. The plane of Raxin was in chaos. The city of great magic and sorcery had fallen to its knees. Antimagic lightning took charge over the buildings, destroying what was left of the great building that had once homed many wizards, learning the secrets of some artefact that materialised one afternoon in the vast halls of Halumin Laboratory. After experiments on it, large amounts of antimagic had manifested, creating this destructive storm. 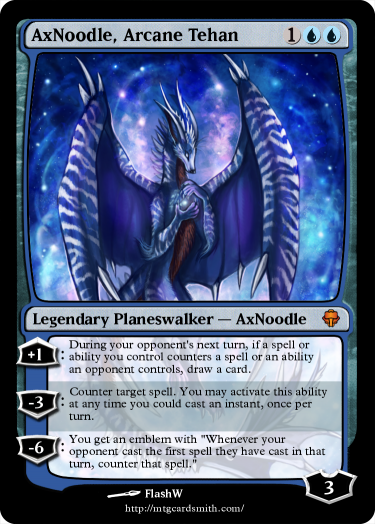 AxNoodle saw only one way to fight back: stop the ball. He ran, dodging and weaving through the falling bricks toward the famous lab where it had homed itself. However, he was a wizard, not an athelete, so his quick pace did not last long. He trudged up the stairs until he was interrupted by a flying chunk of metal. The wizard had barely seconds before he flattened himself to the wall and let it pass. Gasping, AxNoodle limped to the chamber where a blue glow was being emitted. Using the last of his strength and out of reason, he charged the orb. Before waking up in the stream, he did not remember anything. Sure, his home plane was being destroyed, but why was he here? Where even was Here? He tried to get up but tripped on his - hang on, what? A tail? Why is there a tail on my back? He found it was easy to swish around and came easily. His biggest surprise, however, was when he looked in the lake and saw what he looked like. Waking up for a second time, he found himself in a bed made of blue string. He remembered the ball that was destroying his home and suddenly remembered what happened before he woke up here. The question of where here was still unanswered, AxNoodle got up and went to look for answers. Just looking out the door at first, he could see a sprawl of similar grey, stone huts and the people around. They all looked very different, but had similar features - that of cats, foxes, serpents and dragons merged in many different ways into one being. Finding he had wings, he tried them out to explore his new environment. Is @Bobman111 allowed a legendary artifact? Just one thing. Try to keep as much as possible in the same comments since every page only fits 30 comments. You can edit old comments if it was not long ago you posted it. 3 days remains until the first challenge and the deadline for new planeswalkers. 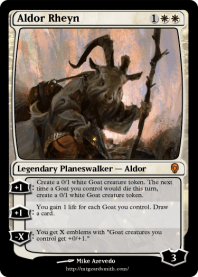 If you would like to join but don't have time yet to create a planeswalker you need only comment and add your preferred niche, then you'll have until the next elimination to post your planeswalker and the required cards. And the last part of the story for now. Turns out flying is harder than swishing a tail. AxNoodle jumped, flapped and barely lasted two seconds before smashing back down on the ground. “Ow”, he grumbled whilst nursing his foot. Back on his feet, the wizard had to simply walk to anywhere where he could find answers. First thought: the library. Upon first glance, it was like any other. Brown, wooden shelves, cobwebs on the least intresting sections, and that signature smell of old paper. Though now, he realised, his nose could smell this a lot clearer. Going straight to the oak shelf labelled “History”, AxNoodle started browsing the large shelves for information about where he was. The books were similarly coloured- brown, black and grey covers that were made of a yet-unknown material. Heck, just about everything was unknown here. AxNoodle still dreaded having to meet one of the real citizens left. He stopped browsing at the book with a green colour, standing out from the rest, named “A Guide to the Tribes of Clancularius”. This should have information worth reading! AxNoodle closed the book and thought about this. Had it brought him here... on purpose? Was there a greater cause for all this? “Nah”, he decided, “that only happens in fiction.” Suddenly, it appeared in his face, pulsating with unknown power. This will probably be the last Story blurb until the challenges start. The thing hit Aggrol with another blast of fire. "What even are you?" Aggrol shouted. "How do you not know what I am? I am a Demon!" "Yeah. Never heard of it." Aggrol responded." "Why you..." The demon charged forward, and attempted to hit him with a close-range fire blast. Aggrol sidestepped the blast at the last moment and punched the demon in the side of the head when it came past. The demon fell on the ground, screaming. "That hurt! Why won't you just stand still?" Aggrol jumped on the demon, badly hurting it beneath his weight. He continued to punch it, but soon, he let up. The demon was trying to say something. "How... How could you beat me? I have trained to fight for thousands of years!" "Well, you were stopped from leaving this cave by a bunch of goblins, so you can't be that strong." Aggrol responded. He raised his fist to deliver the finishing blow... "No! Stop! Please! Give me mercy, and I will let you leave. I won't come after you. Please, just spare me!" Aggrol thought about this. Eventually, he decided to let the demon go. "Promise me you won't follow me." "Oh, I won't need to follow you." the demon said. "You'll be staying right here!" He breathed another stream of fire, which hit Aggrol straight in the chest. "I am more powerful than you could imagine. True, that did hurt. A lot. But it didn't defeat me. Now, I will feast on your magical essence for years!" The demon laughed maniacally. But Aggrol wasn't ready to give up yet. Just as he was about to get up and continue his assault, he felt something underneath him. "Groundwater." he whispered. "What was that?" The demon asked. Aggrol was running out of options. He had to try it. "I said that there is groundwater underneath our feet right now." The demon stopped right in front of Aggrol. "Or more specifically, under your feet." With the little magical energy he had left, Aggrol summoned a gigantic pillar of water directly under the demon's feet. The water struck with such force that the demon was shot all the way up to the ceiling, and then back down again. It hit the ground with a sickening crunch. Aggrol walked over and kicked the demon. It was dead. "Well, that's not surprising. Not only was it hit by water, and it seemed like a very fiery being, but it also dropped from that height. That would kill many things." Aggrol stood up, and went to the exit. Nobody tried to stop him. Well, unsurprisingly, Aggrol was victorious. 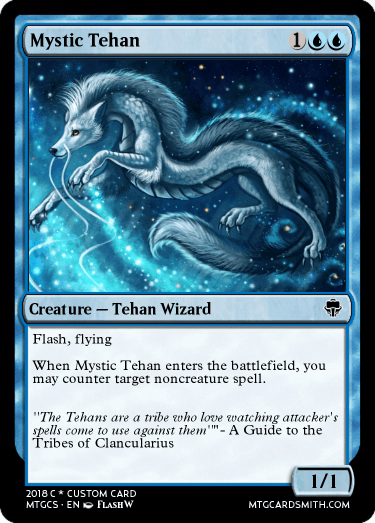 But he has now accessed a new power, one that will show up on the next version of his Planeswalker card. You have arrived in this new world. The only knowledge you have is what you can see and hear around you. Is it a vast open field without the smallest indication of life or are there large cities just around the corner. The only thing you know is that you need to know where you are. You need to gather knowledge through either exploring the surroundings or ask the people that lives here. Maybe they don't want to share their information so that you have to take it by force. Or are there any other way to gather this knowledge? --- Since this is the first challenge I will explain what the text above means. You have a problem. You are lost without knowledge. You have to find a solution to this. *Looting/Draw and discard or discard and draw, (gather the important knowledge. *Or something else that could solve this challenge. As you probably see already is that some colors will have much more difficult to solve this problem. Here is where the creativity in the challenge lies. If you solve the challenge in a creative way then you are rewarded. Or maybe you want to keep your card slots for later challenges and thus taking a higher risk of being eliminated. Most of these eliminations won't have a card limitation but as said earlier. You should cover most needs that a good ordinary deck would have with your total card collection. 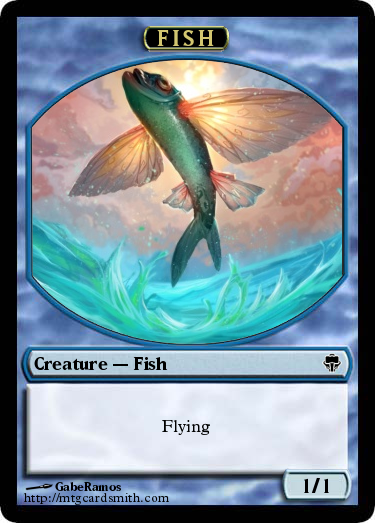 This is also true for a balanced mana curve. You won't be given a choice of new statistics as this is the first challenge to keep it simple. These will be better next week. 1 uncommon card slot (A total of 2 with the one you already have. ---Like I said, you don't need to use these slots for this challenge. You can keep them both, keep one and use one or use them together with earlier kept spell slots to increase your chances to survive the first elimination. Remember that challenge cards have a double potential points for that week and will be judged how well they solve that problem and how creative they are made.